This waterfall managed to evade me for several years longer than most. The reason was due to a mistake on the OS maps. The waterfall is named on the maps, but on all map scales (1:50'000 all the way to 1:10'000), it is not marked as a waterfall. 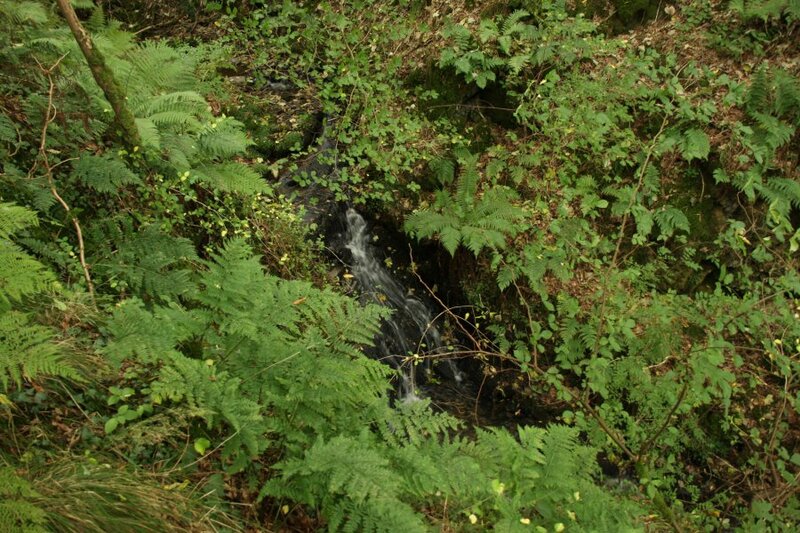 Instead, the name ("Ffrwd Fawr", meaning "big torrent") is written as if it were a label for a location or house. As for why it is not precisely located on any maps with a waterfall symbol, this may well be due to it being extremely difficult to reach; perhaps the OS cartographers decided it was safest not to approach it in order to get an actual location. 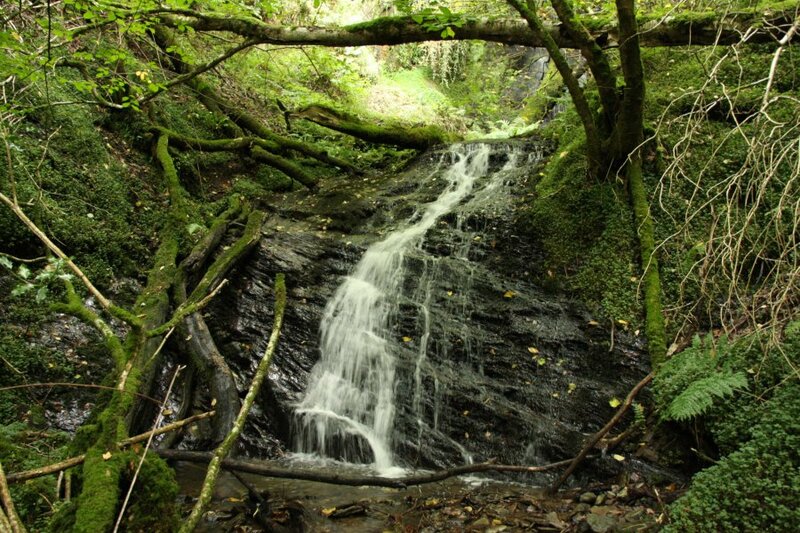 The waterfall is located to the south of Llanidloes, and is not related to the much better known waterfall of the same name at Dylife. View from the B45418 in the tiny village of Nantgwyn, between Rhayader and Llanidloes. 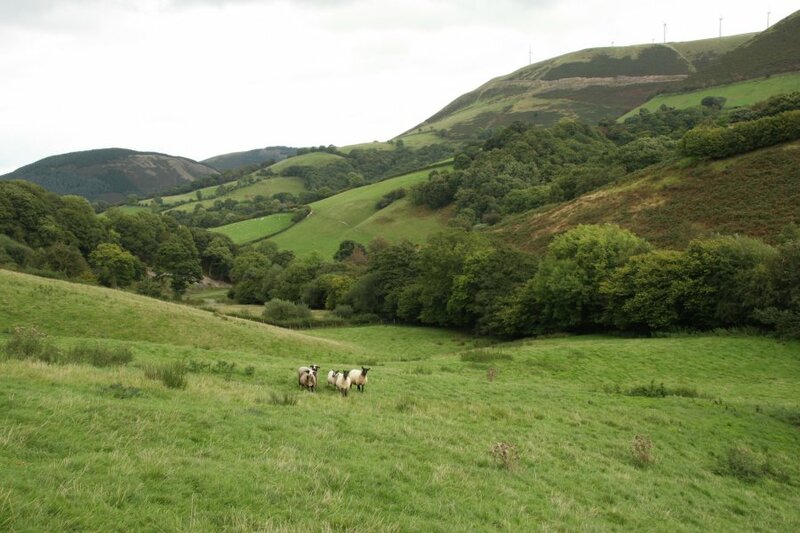 The hills are Pengwn Mawr (586 metres), Pengwn Bach (569 metres) and Crugyn Llwyd (571 metres). 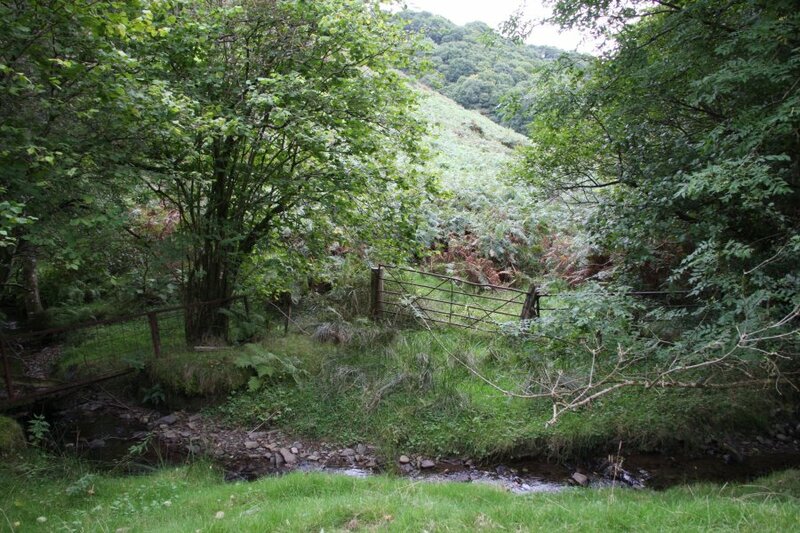 Incidentally, the area known as "Pistyll" and the "Cwm Pistyll" valley lie on the wooded slopes to the right. 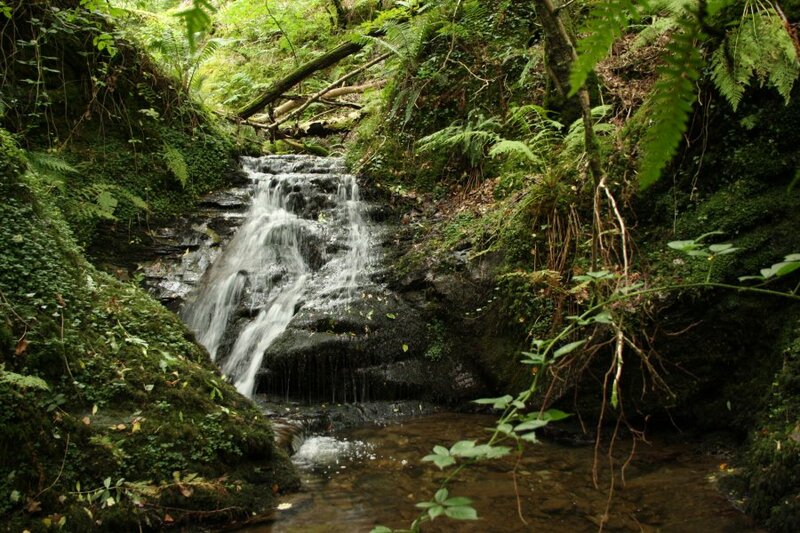 However, this is a case of "pistyll" meaning spring rather than waterfall. The Nant Feinion valley seen from the Llidiartywaen Community Centre, where my walk begins. The hill with the wind farm is Pengwn Mawr, with Pengwn Bach and Crugyn Llwyd on its right. 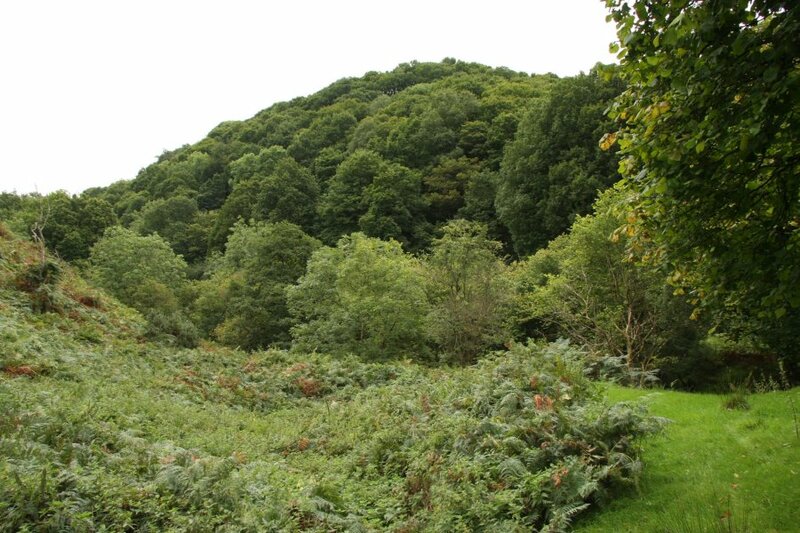 The Cwm Diffwys valley - target of this gallery - is the wooded valley to the right of the middle of this picture. 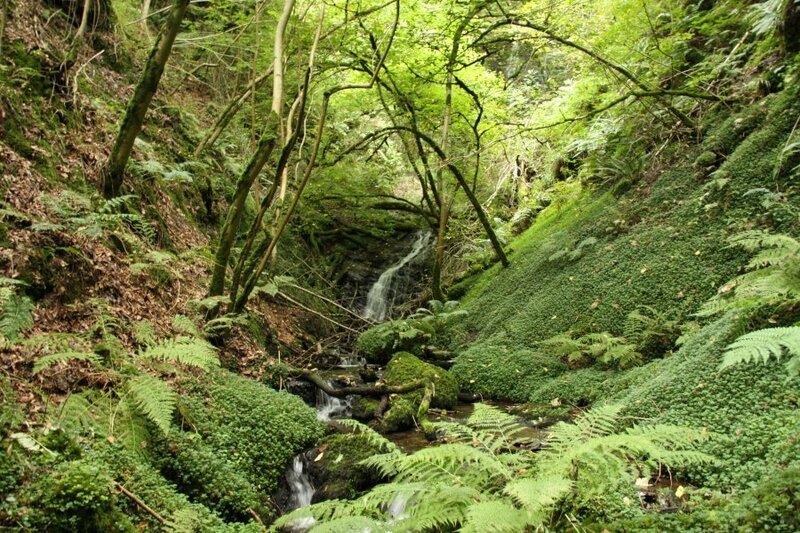 Although the view from here would be improved in winter, it is unlikely that the waterfall would be visible through the trees. 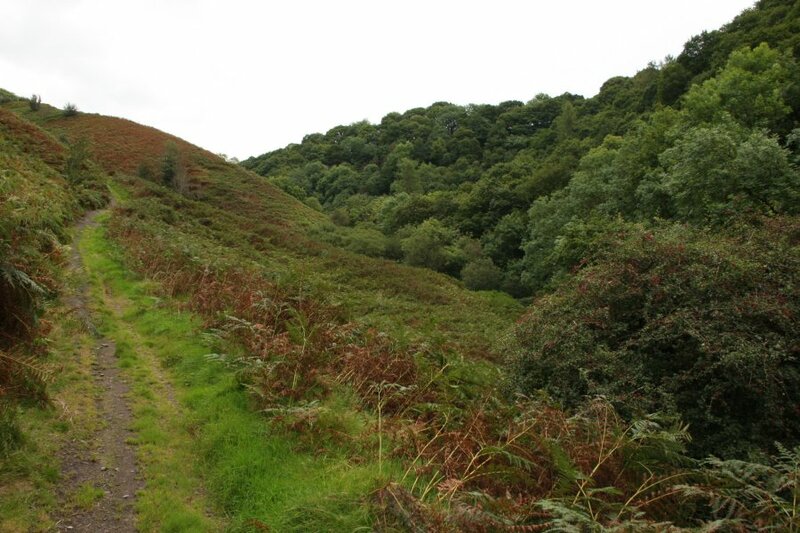 My route began by following Glyndŵr's Way down a steep track into the valley, then branched off on an overgrown track into a field. Or at least, this was shown as a track on the map. 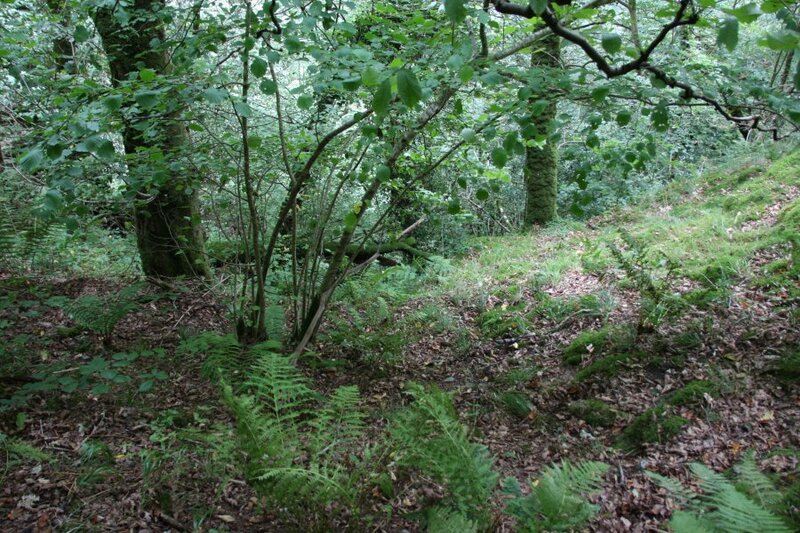 The nettles, brambles and bracken were all armpit-height. 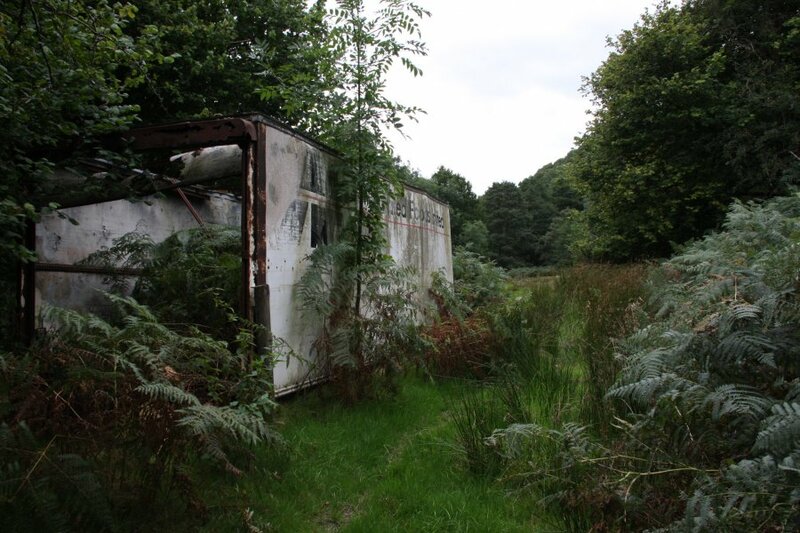 At some point, there must have been a proper track here, because that is a lorry trailer, slowly rotting in a field. A useful landmark, though bizarrely out of place in a remote field. Fording the stream into a heavily overgrown field. The ford itself looks too steep even for agricultural vehicles, and the gate has clearly not been used for a long time. 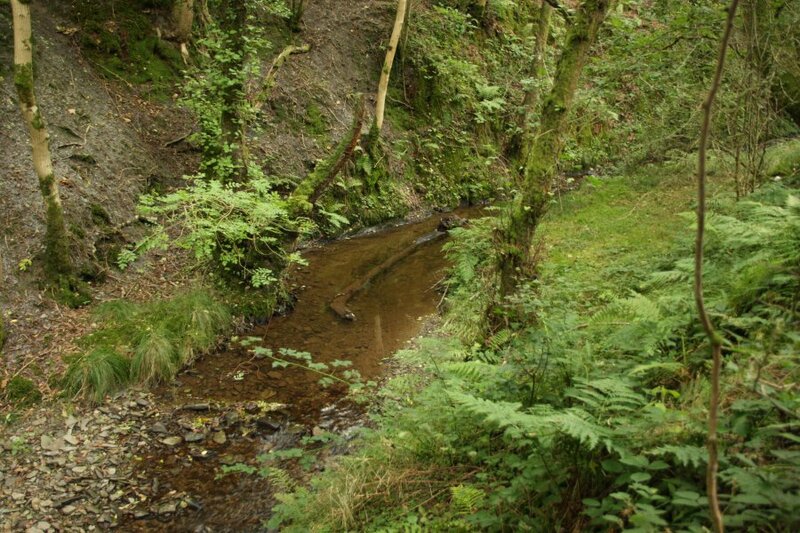 Mouth of the Cwm Diffwys valley. Ascending path on the bank of Cwm Diffwys. 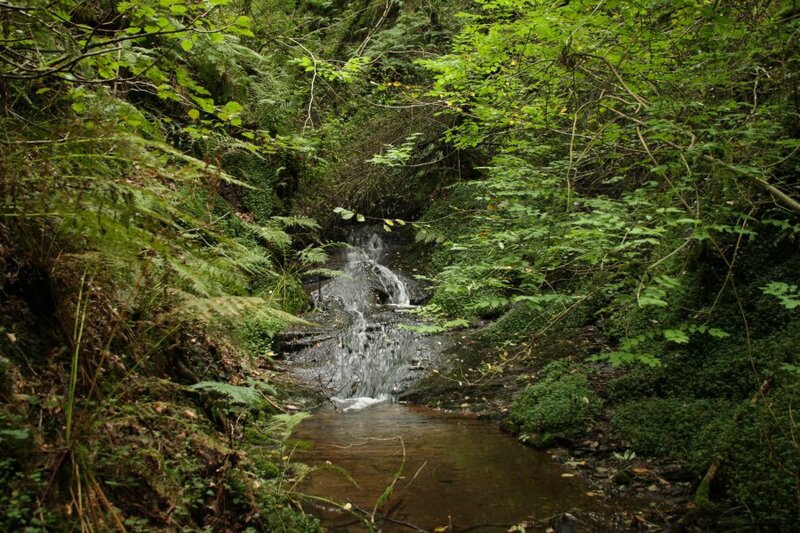 My route was to wade through the undergrowth to reach the stream. 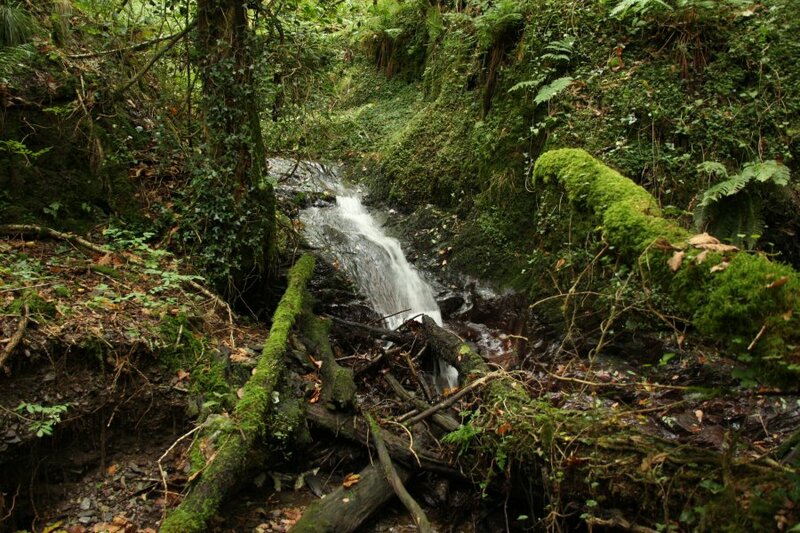 The stream began fairly easily, but with occasional fallen trees blocking the route. 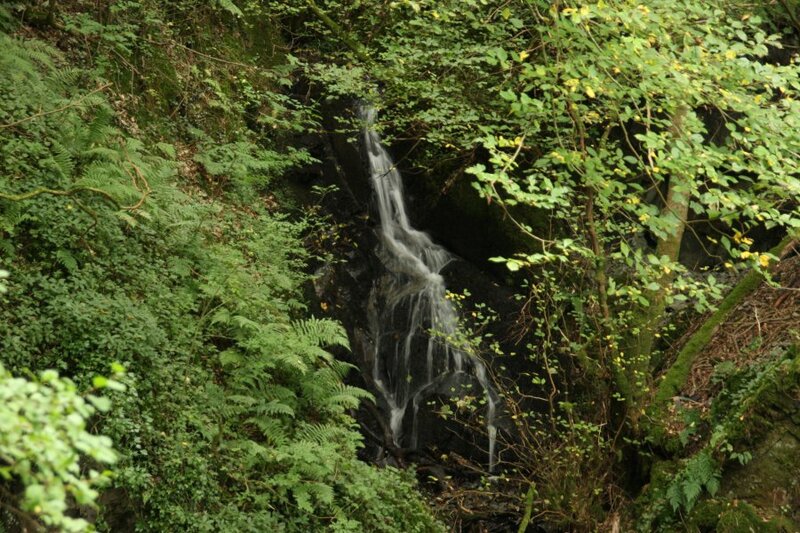 The first cascade worth photographing, only a little over a metre high. 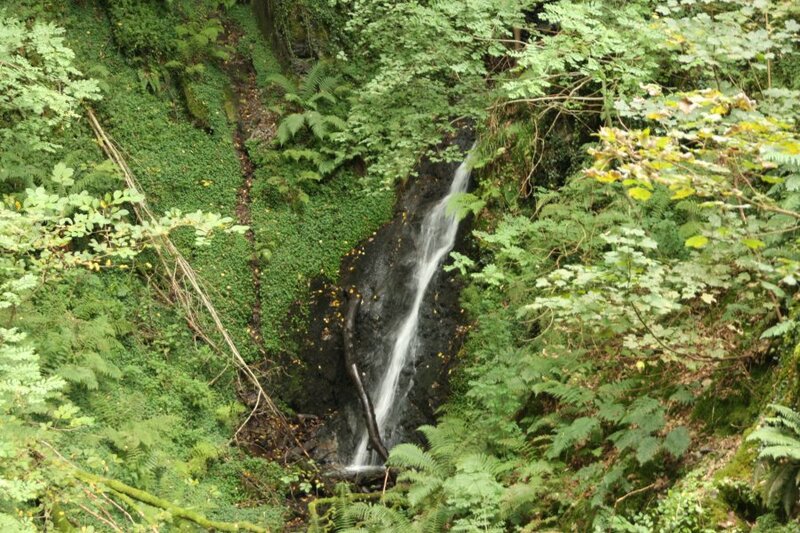 As with most of these cascades, the walls are so steep that the easiest way upstream is to climb the cascade itself. 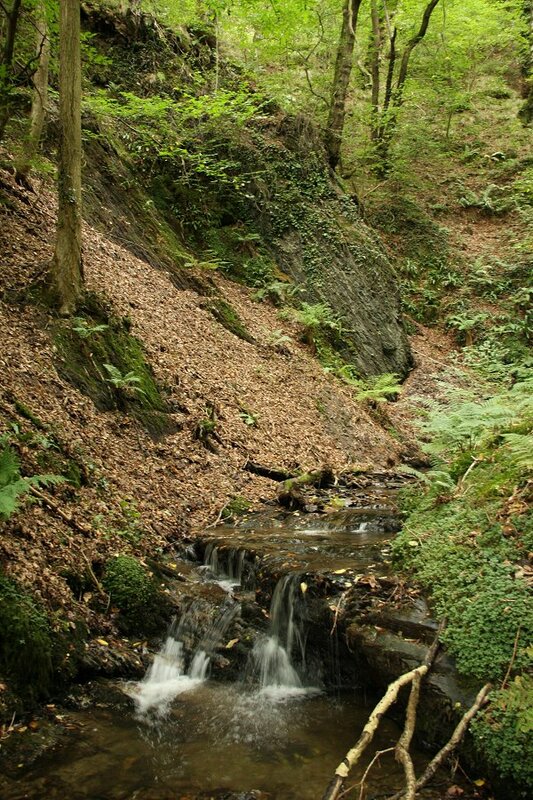 The second cascade, 2 metres high. The fallen trees above this proved to be particularly difficult. Getting past them required an ascent of the steep banks to pass the exposed roots, with the slope falling apart under my feet, threatening to drop me back down to the valley floor. Large exposed rock on an abrupt right turn in the stream. The ascending path is somewhere far above the left bank here, and may be the best way to get above the waterfall from here. Gorge section with another cascade at its head. Another small cascade. Though only a metre and a half high, this proved to be one of the hardest to get past. 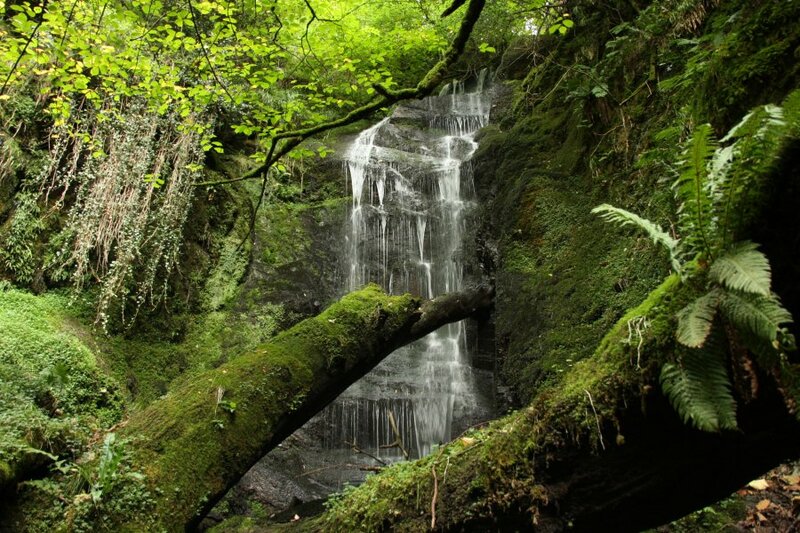 A tree had fallen at the head of the cascade, and the bushy branches were too thick to get through. I had to force a way through the branches on the right instead. Finally a real waterfall, 5 metres high. This one also was very hard to get past, as the sides were too steep to safely ascend. Instead, I had to use the fallen logs as a climbing aid to climb the cascade itself. 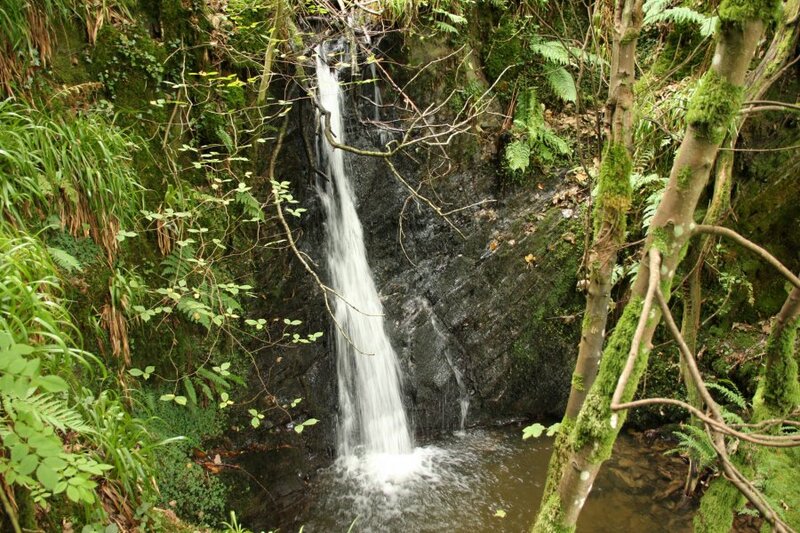 Above it is the main Ffrwd Fawr waterfall, at least 12 metres tall, in a luscious setting. The bottom metre is not visible in this picture due to the collection of fallen trees blocking the view, but they frame the picture very nicely. Now the crazy part; getting above the waterfall. 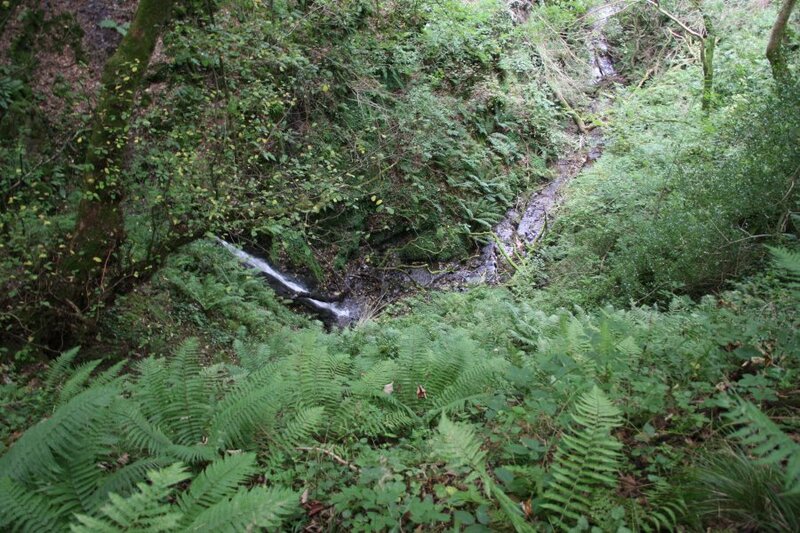 The sides - seen here from below the 5 metre waterfall - are extremely steep, and get steeper as they get higher. The sides look like they might offer a grip, but they are made from shale layered onto very slippery rock, with nothing holding them together. With every step, the ground gave way and slipped down the banks to the stream. Very slow progress upwards, with a good few hair-raising moments, grasping at tiny saplings in the hopes that they had gained more grip than I had. Looking downhill at the top of the steepest part, some 10 to 15 metres above the stream. The going got easier and the trees got larger, but it is hard to convey this situation in a picture. 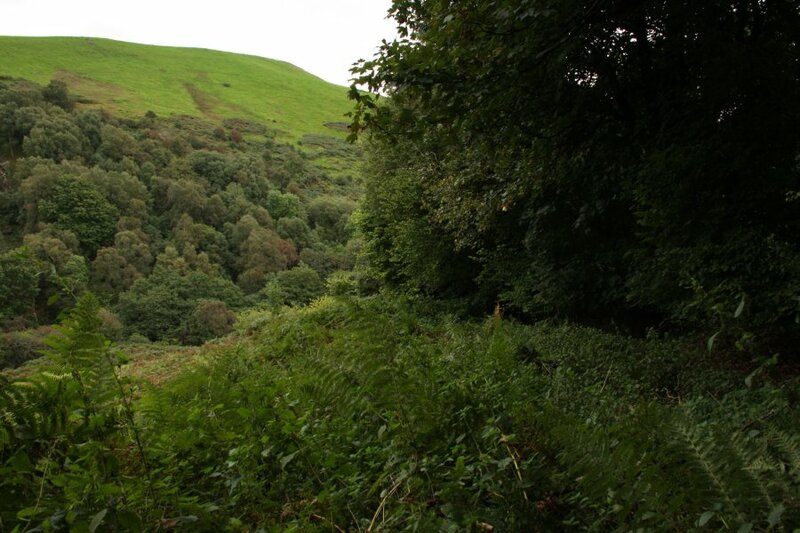 That lip at the tree line marks the edge of the precipice ("diffwys" in Welsh, hence the name of the valley). Even here, the ground was still very steep, and although I now felt it was acceptable to get the camera out, it was still steeper than most walkers would consider ascending. A mistake here would still have severe consequences. Perhaps this conveys it better; looking across the slope. 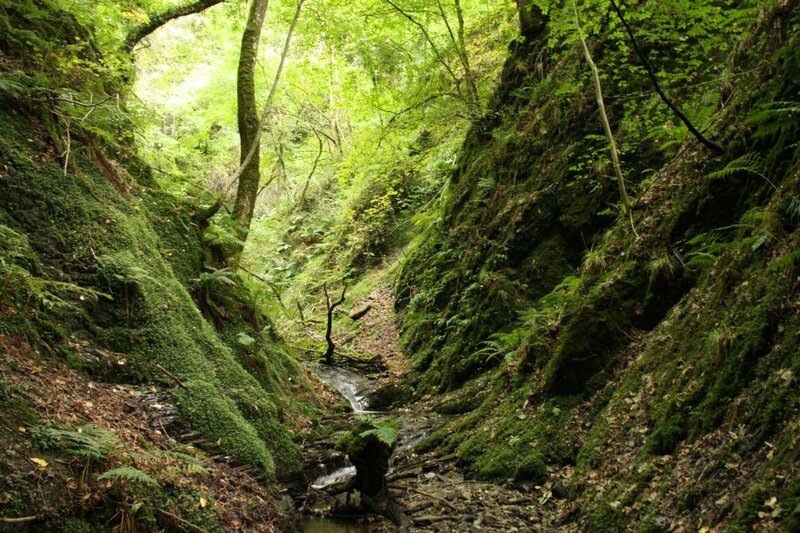 Hidden in the undergrowth is the lip of the almost-vertical cliff, 15 metres down to the stream. I decided to go much higher in order to bypass that precarious situation, up to the fence line of the upper fields. 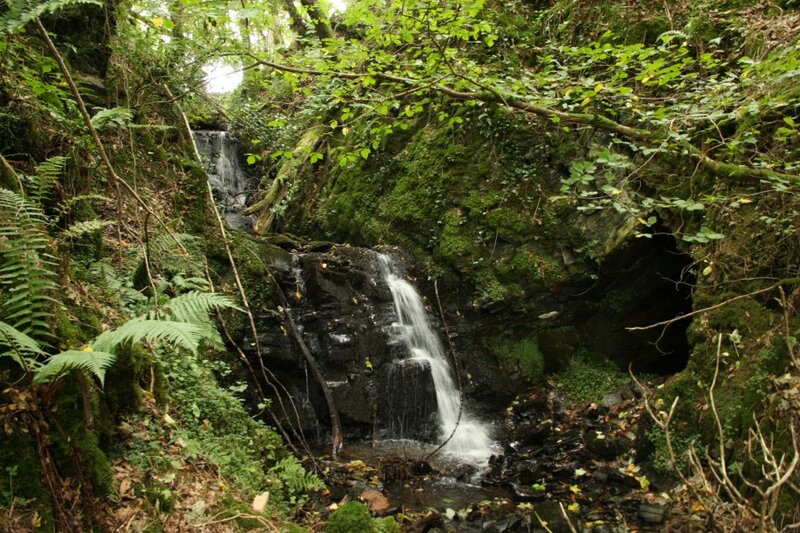 Above the main waterfall, I descended back down to the stream, where there was a 6 metre waterfall. Above this, the stream splits. It is possible that the right branch also had waterfalls, but it didn't immediately look like it, so I only followed the left branch, which looked more substantial. The left branch begins with a 6.5 metre waterfall in an impressive amphitheatre. Immediately above was another waterfall, 6 metres tall. To get above these two, I initially tried to get back up to the fence but was forced back by the undergrowth. 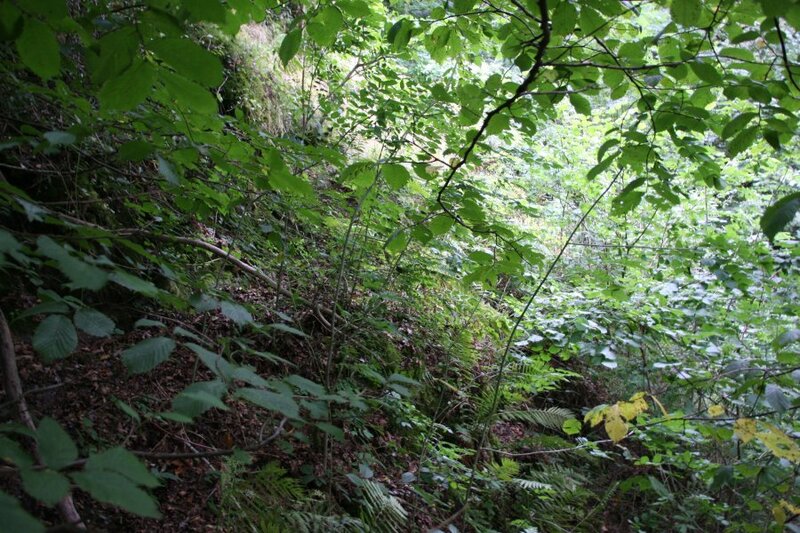 Instead, I had to tack upstream along the sloping wall of the amphitheatre, 15 metres up on a bank so steep that only the ferns and the brambles could get a purchase, and no trees could help support me. Tiny cascade upstream of the main falls. The last of the significant waterfalls were these pair of cascades, each 2 metres tall, and rather difficult to ascend without getting soaked; I failed, and ended up quite wet. 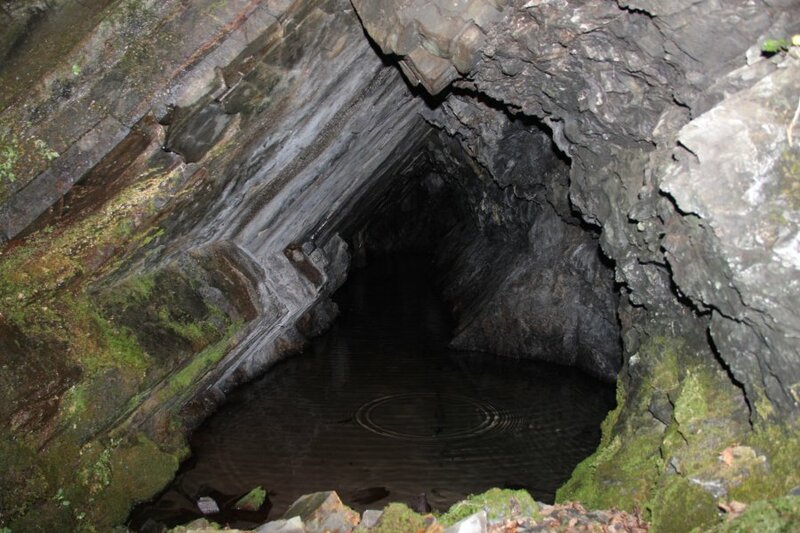 To the right of the cascades is a short adit, probably just a test drift, dug to sample the minerals. 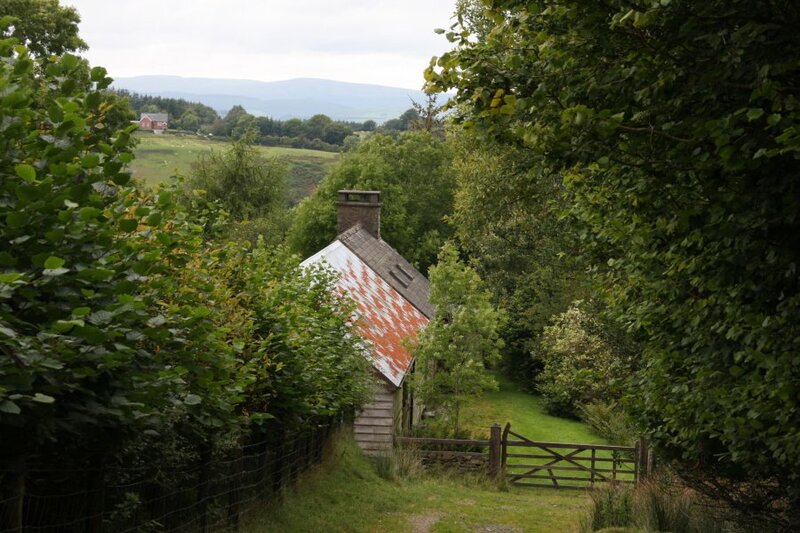 This appears to be a house and stable, at the top of the valley. The upper waterfalls may be visible from their garden. View back over Cwm Diffwys and Cwm Feinion. The hill in the centre is Pant-poeth Hill (422 metres) with the community centre on its right side. On the right is Moelfre (429 metres). 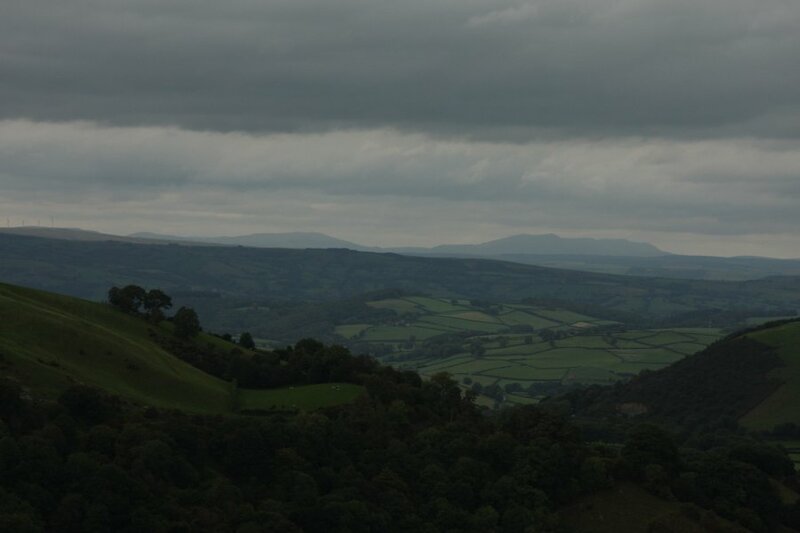 On the distant left are the ridges surrounding the Wye valley, at around 500 metres high. In the distant right between Pant-poeth Hill and Moelfre is the Pumlumon range; Y Garn (684 metres), Pumlumon Fawr (752 metres), Pen Pumlumon Llygad-bychan (727 metres) and Pen Pumlumon Arwystli (741 metres). View over Glyn Feinion as it reaches out into the Severn Valley. On the left are the same hills as the last picture. In the mouth of the valley on the right are the three small hills of Coed y Gaer (362 metres), Coed Mawr (308 metres) and Y Foel (435 metres). In the distance - visible in the last panorama - is the Aranau range in Snowdonia; Pen y Brynnfforchog (685 metres), Glasgwm (780 metres), Aran Ffawddwy (907 metres), Erw y Ddafad-ddu (872 metres) and Aran Benllyn (885 metres). 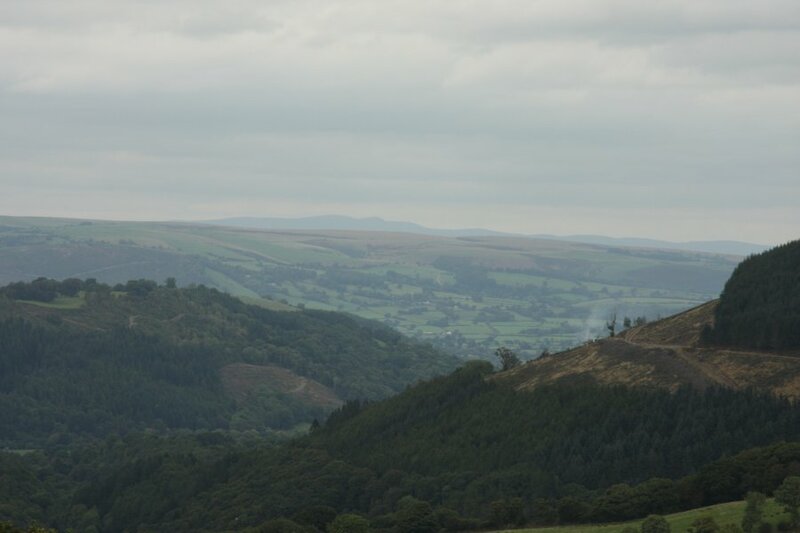 To the right - also visible in the last panorama - are the distant Berwyn mountains; Moel Sych (827 metres), Cadair Berwyn New Top (830 metres), Cadair Berwyn (827 metres), Cadair Bronwen (785 metres) and Tomle (742 metres). Y Foel and the ridges of Pengwn Mawr. 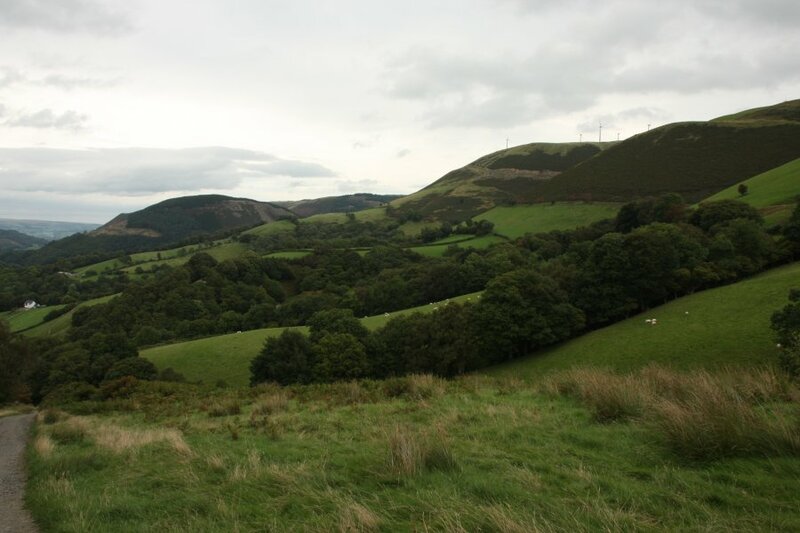 The ridges are separated by various little valleys, with Cwm Cignant being the heavily wooded valley in the middle of the picture. 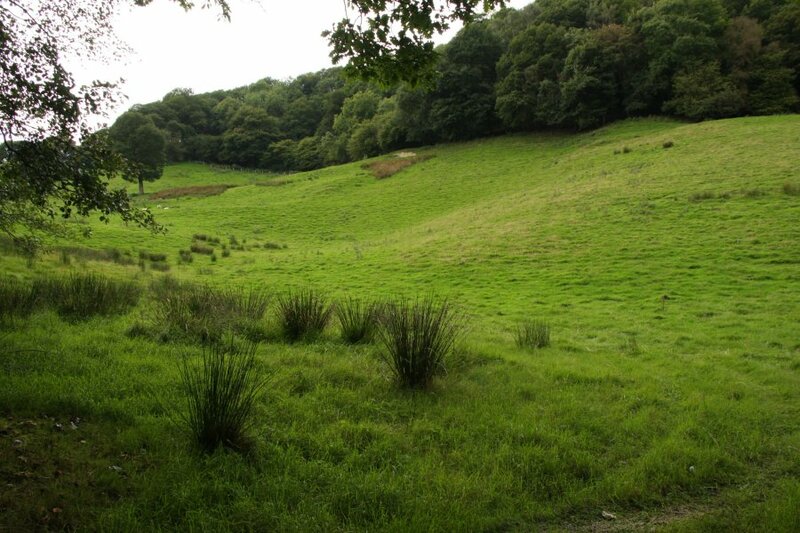 Pwll Rhemp, a name mentioned in a field on the bank of the Nant Feinion. The name translates to "rampant pool" or "rampant hole" (make of that what you will), and might suggest a fast flowing waterfall plunge pool. However, there is nothing to see here. No pit. No pool. No waterfall. No hole. 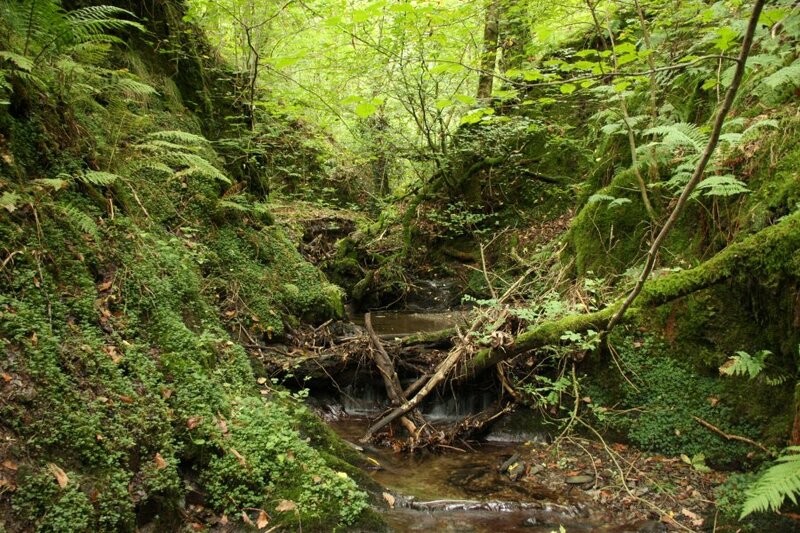 Even the nearby Nant Feinion does not have any significant pools at this point. Looking back over the Pwll Rhemp field. End of the gallery, the sheep bid farewell.